You know what a demand is right? It’s when you ask someone to do something in a way that makes it clear that you don’t expect it to be refused. It’s necessary to make demands of our children to give them guidance, to help educate them and, in all honesty, sometimes just to get them to do what we bloody well want them to!! So what happens when a demand, no matter how small or insignificant, causes crippling anxiety in a child? Well they’re going to avoid it at all costs aren’t they? 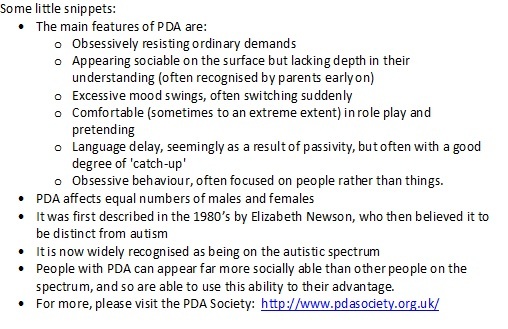 Welcome to the world of Pathological Demand Avoidance Syndrome or PDA as it’s helpfully abbreviated to. It is on the autistic spectrum, it is just as much fun as it sounds and it is incredibly difficult to manage. Wee Man has a diagnosis of PDA. What joy. What this means is that we have to be very careful with how we go about telling him to do something; from cleaning his teeth, or putting on his pants (never actually managed this one yet!) to being careful crossing the road. He will avoid, manipulate, distract, kick off, melt down, avoid, AVOID!! No matter what it is, even if it is actually in his interest to do it. It really is the most bizarre thing sometimes. It’s all about control. He will attempt to keep control of a situation by any means possible. Whether it’s just making sure he gets into the car in his own way (i.e. walking backwards, with his shoes on his hands and wearing no pants) then he will do this rather than simply follow the instruction to “get in the car now Wee Man”. If he’s done it in his way, then he has kept control and that’s ok for him. He can also be incredibly manipulative and clever about getting around doing something he’s asked; before you know it, you can get completely tangled up in a 10 minute long conversation about the merits of Spinosaurus over T Rex, and who would win in a fight, when all you did was ask him to put on his coat!? The strategies we use with Wee Man mainly involve disguising demands. So, we make everything into a game, a race or a challenge – “I bet you can’t get into the bath before I count to three” for example. This has worked pretty successfully up until recently – seems as he’s getting older he is sussing this particular strategy and has been resisting even the games. Another approach that works is to feign helplessness or stupidity (he loves ME doing this one!) – a few weeks ago, I found myself asking him to show me how to get into the car because I’d forgotten how to do it. I looked like a complete twit but who cares? It worked! On some days Wee Man’s PDA is far more evident than others. If he’s particularly stressed out or had an upset of some sort, then the avoidance will build up and up and eventually peak in an almighty meltdown. So far, his pattern has been that he gets a bit easier after this explosion – I’m waiting for one to happen at the moment actually as it’s been a tricky few weeks. There are many other children with PDA who are desperately disabled by their pathological need to avoid demands and maintain control – many cannot attend school at all and are home schooled by their parents. Although Wee Man’s PDA tends to fluctuate, so far it has been manageable. This could change as he grows up and increasing social and educational demands are put on him. We just don’t know. But I can tell you this; he’s very stubborn; he’s one hell of a leader, and can persuade pretty much anyone to do anything for him…I can certainly think of a few occupations where those skills are required! This entry was posted in PDA. Bookmark the permalink.